Coastal flooding will be exacerbated by onshore winds on Tuesday. It now appears minor flooding will be likely with pockets of moderate coastal flooding possible. 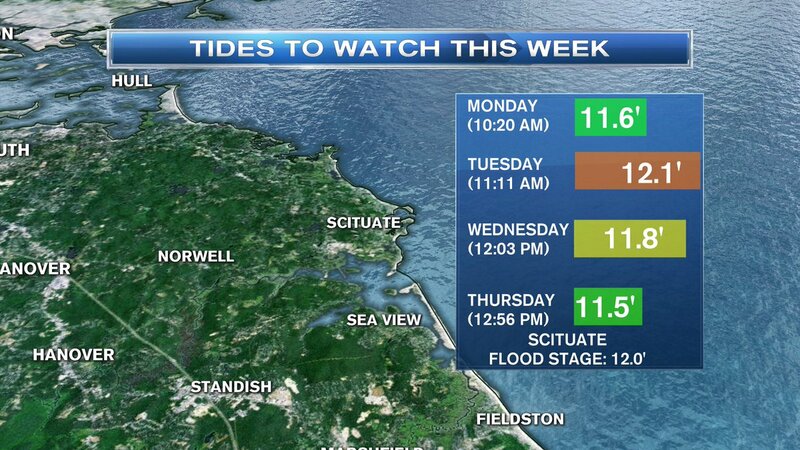 The threat is greatest during the high tide cycle around midday. Because of the astronomical high tide Tuesday, minor flooding will be realized. Onshore winds will add another half foot to foot of water to the already high tides. There are 3 flood gauges in eastern Massachusetts: one in the Boston Harbor, another in Gloucester and the other in Situate. The National Weather Service is able to predict which areas will flood based on the data provided at these gauges. The best case for Scituate would also mean some minor flooding, “Minor flooding and beach erosion is expected across low lying sections of Cohasset, Scituate and Marshfield. Immediate coastal roads may be impassable for a time nearest the time of high tide,” according to the National Weather Service. At 13’, “flooding is expected in low lying areas of Cohasset, Scituate and Marshfield. Some localized evacuations may be required as coastal roads become inundated. Large waves will produce beach erosion,” according to the National Weather Service that’s the worst case scenario in this case.